Beautiful beads are made from sustainable tagua nuts, dyed vibrant turquoise and polished to a high gloss. 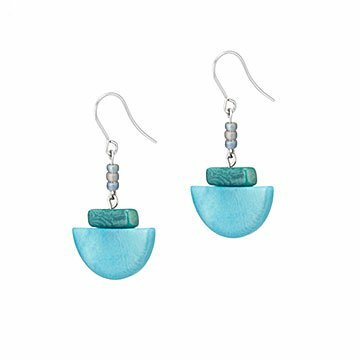 Heavenly blues and playful Art Deco shapes come together on Monica Farbiarz's elegant and fun earrings. Dyed vibrant turquoise shades and polished to a high gloss, the hand-carved beads add movement and charm to dresses and stylish, sky-colored accents to jeans and a T-shirt. The beautiful beads are made from sustainable tagua nuts. Also known as "vegetable ivory," their grain is close and very hard like that of elephant tusks, but they come from a plentiful South American tree, not an endangered animal. The nuts fall to the ground when mature, so harvesting them does no harm to the tree. Handmade in Colombia.